Asado in general is a term used in some Latin and Southern American countries for a range of barbecue techniques it is even used as a standard word for barbecue in that region. Now Filipino-Chinese Asado is a bit different and it is more closely related to the Chinese Char Siu which is a type of Asian barbecue marinated in sweet and savoury style sauce. If you will be connecting both information together I guess you can almost derive why this dish is called such. Chinese and Spanish are the main influences in the Philippine cuisine and this is a good example in a marriage of both, it is named in Spanish but the flavours used are of Chinese origin. Like what I had said it closely resembles the Chinese Char Siu and the big difference is that this is not baked or roasted but it is braised. 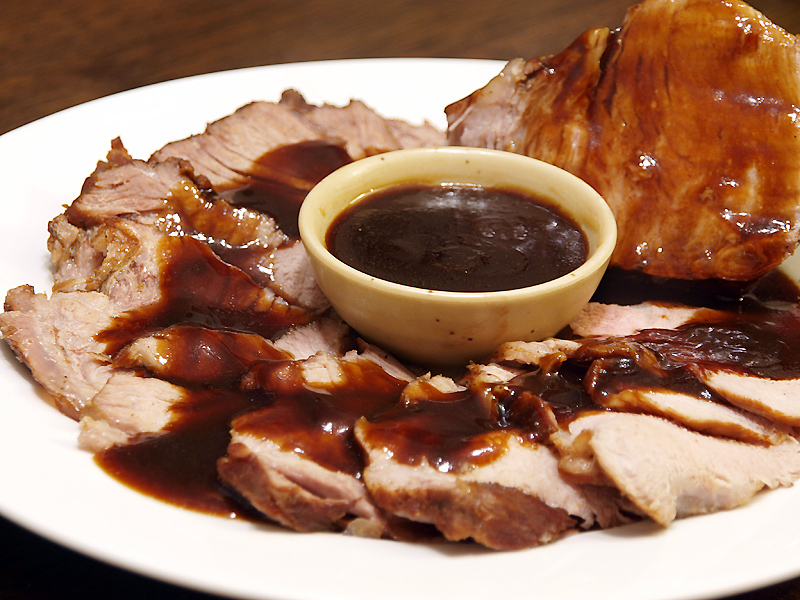 It uses a whole slab of pork tenderloin then it is sliced only when served similar to how the Chinese prepare their Char Siu, Roast Pork, Lemon Chicken and Hainanese Chicken. Ingredients are a bit different that is why you don’t see fermented tofu and sesame oil in the ingredients list; instead soy sauce is used for colour and flavour along with other sweet condiments and spices such as raw sugar and Chinese five spice. Marinate pork in soy sauce, five spice powder, garlic, onion, Chinese Cooking wine and salt for at least an hour. Place marinated pork together with water, peppercorns, bay leaf, dark soy sauce and marinade in a pot and let it boil and simmer for 1 hour, turning once. Remove pork from pot then set aside for at least 10 minutes to cool down. Strain the braising liquid and place on a saucepan, add the dissolved cornstarch mixture and simmer until sauce thickens. Slice pork tenderloin thinly then pour sauce on top. Note: You can adjust the soy sauce and sugar content to your liking, pork asado is meant to have a very strong sweet and salty taste. Remind me of that served with the char siew rice over it, looks so tender and will go without the dipping. Looks so tender, juicy and delicious. Yet another very YUMMY recipe! I am looking at this wonderful pork dish and have just realised that since you post every day, it means you cook at least once a day the delights you write about! I am really impressed. That sauce!!! Looks so delicious. Okay, just a quick comment before I start licking the monitor…that’s a gorgeous photo! Sounds superb – a beautiful rich dark sauce. The picture looks so good I can literally taste the meat. Now this looks like an amazing piece of pork. Delish! I can’t wait to try this recipe out. I cooked this dish 2 days ago. I used chicken breast instead of pork, it came out sooo good. The sauce was to DIE for…. I have my special Char Siu recipe that is so juicy and tender http://tasteometer.blogspot.com.es/2014/04/char-siu-pork-chinese-bbq-pork.html but I’d like to try this recipe too sometime.